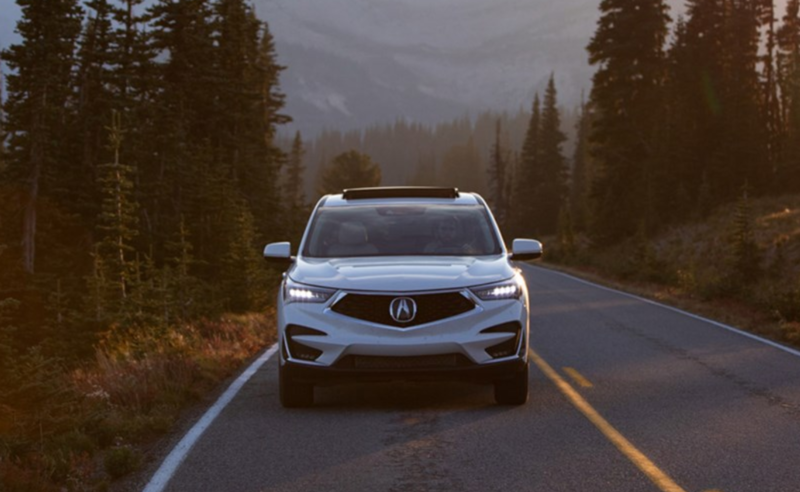 The 2019 Acura RDX is one of the best-selling compact luxury SUV’s and the brand’s most popular model. A complete redesign for this year brought with it more daring styling inside and out, plenty of tech features and a turbocharged 4-cylinder in lieu of the naturally aspirated V-6. The RDX, and Acura brand as a whole, occupies a middle ground in the market somewhere above mainstream and below full-on luxury automakers. Acura occupies the same gray area as Lincoln, Volvo and, to some extent, GMC and Mazda. As a value leader, items like Acura’s reputation, lackluster dealership experience, interior materials quality and lack of engine options are forgivable when the RDX has a starting MSRP of $37,400, which is significantly less than the BMW X3 and Mercedes-Benz GLC. The 2019 RDX was given much more expressive styling with its redesign, so a bold exterior color is fitting to its mission to shake things up and stand out from the crowd. Select Apex Blue Pearl to nicely set off the the bodyside sculpting, flowing roofline and chrome grille surround. This color is a $400 option and is only available with the $3,000 A-Spec Package, which requires the $3,200 Technology Package. So essentially right out the gate the RDX went from $37,500 to $44,000 even. With the A-Spec package comes a selection of black or red interior options. While the black interior looks fine, it’s a tad boring. We’ll proceed with the red interior in keeping with this RDX’s flashy exterior color. When equipped with the A-Spec package 20-in Shark Gray wheels come standard on the RDX. Hopefully these won’t look too outdated in a few years as shoppers grow tried of the dark wheel trend that has swept the industry. A 272-hp 2.0L turbocharged 4-cylinder engine comes standard and is matched up with a 10-speed automatic transmission. Front-wheel drive is standard, however you’ll want to upgrade to the excellent $2,000 Super Handling All-Wheel Drive system for added handling prowess. That brings the price to $46,000 even. Three packages are available on the 2019 Acura RDX. To start, shoppers can select from the aforementioned Technology and A-Spec packages. The Technology Package brings with it equipment like advanced safety features, an upgraded infotainment system, and upgraded leather seats. The A-Spec package gives the RDX personality. With unique front and rear bumpers, a unique grille design, and darkened headlamps and taillamps, Acura did a solid job of making this package differentiated and compelling. Inside, the A-Spec RDX has upgraded materials, heated and ventilated front seats, and other extras that create a modern ambiance. It should be noted that the A-Spec Package is only available with the Technology Package. The third and final package is the Advance Package, which requires the Technology Package but is not available with the A-Spec Package. The Advance Package includes features like adaptive dampers, acoustic from glass, wood trim, upgraded front seats, heated rear outbound seats and other luxury features. Overall, the A-Spec package better suits the RDX’s sporty design and costs $1,900 less, so we’ll stick with that. This nicely equipped RDX comes out to $46,995 after destination. That compares favorably against competitive models from Audi, Lexus, BMW, and Mercedes-Benz. Any closer to $50k and the Acura’s sheen would begin to dull as it doesn’t offer an upgraded engine option.